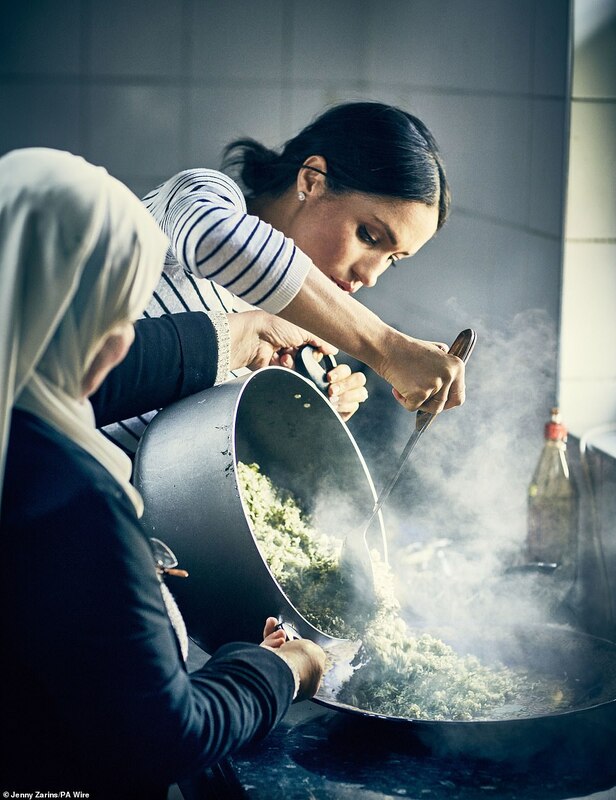 The Duchess of Sussex made secret trips to a community mosque to cook with Grenfell Tower victims after the horrifying inferno that left 72 dead, it emerged today as she helped to release a new cookbook. 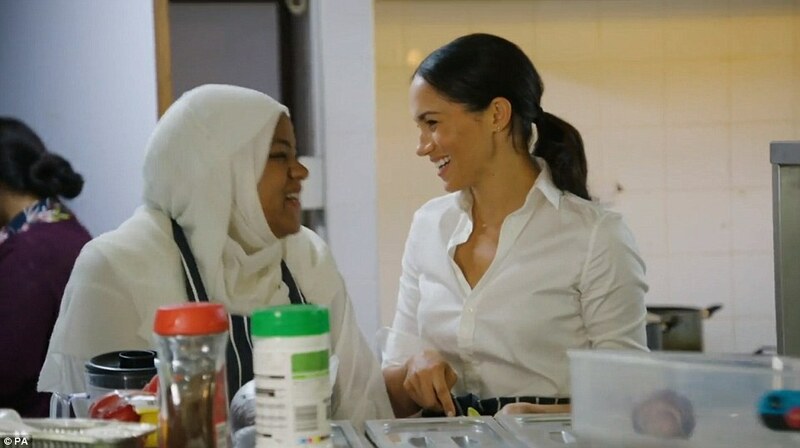 In her first solo project as a member of the royal family, Meghan Markle has written the foreword to the new book produced by cooks from the Hubb Community Kitchen, an initiative based near the site of the West London tower. 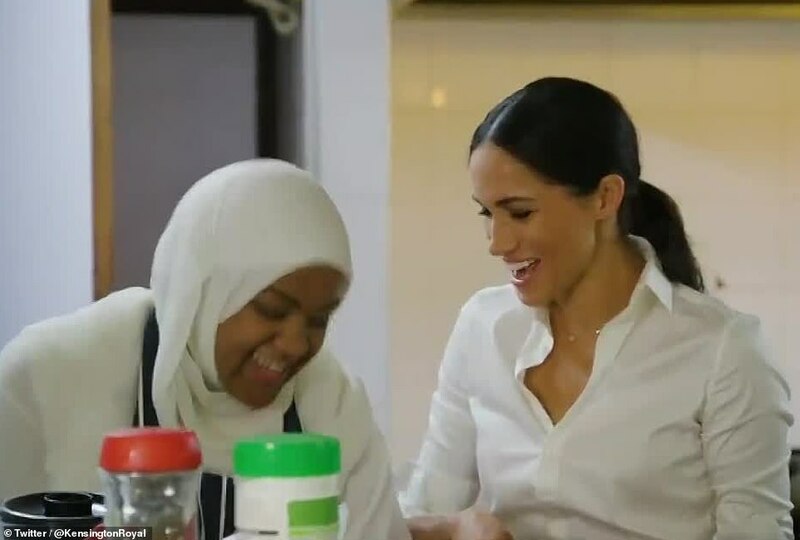 The duchess, who said she 'immediately felt connected' to the kitchen at the Al Manaar cultural centre, first visited in January and has made other secret trips to the centre to meet volunteers and learn more about their work. 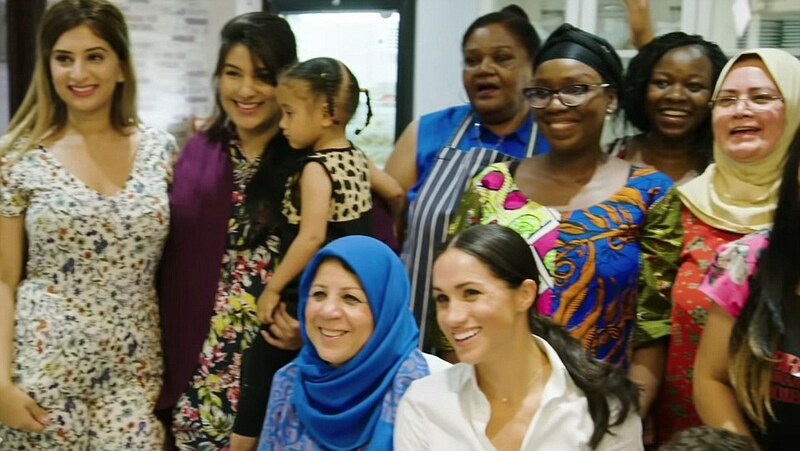 The duchess says in her introduction for Together: Our Community Cookbook: 'I immediately felt connected to this community kitchen; it is a place for women to laugh, grieve, cry and cook together. 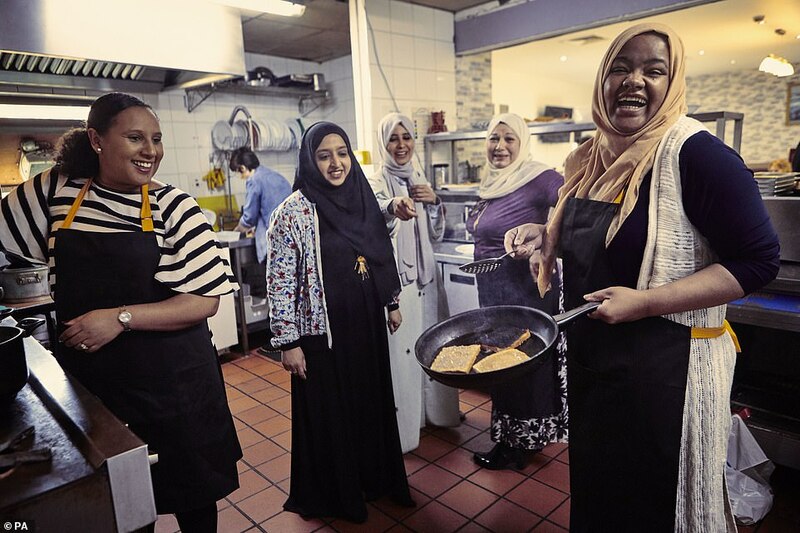 'Melding cultural identities under a shared roof, it creates a space to feel a sense of normalcy - in its simplest form, the universal need to connect, nurture, and commune through food, through crisis or joy - something we can all relate to. 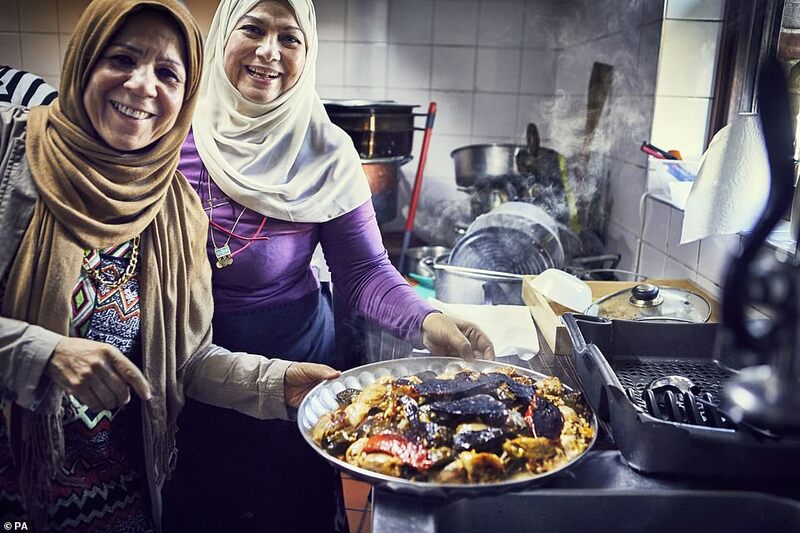 'I immediately felt connected to this community kitchen; it is a place for women to laugh, grieve, cry and cook together. 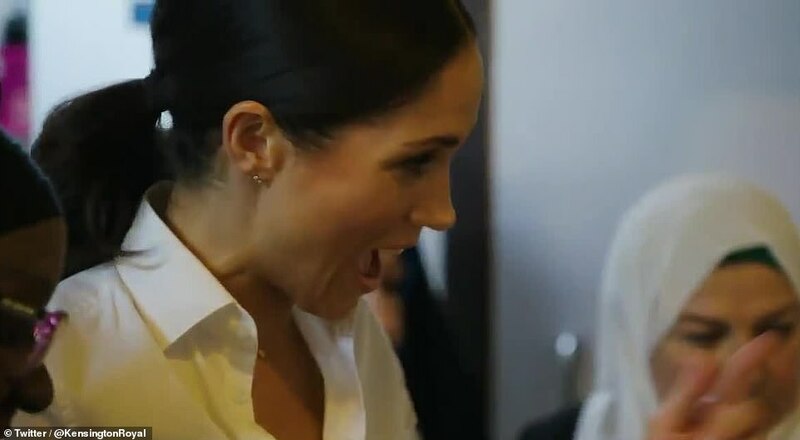 It also emerged today that two of the women who worked on the cookbook with Meghan saved the lives of seven people from different families. MailOnline can reveal Hiwot Dagnachew was on the fifth floor and stopped her two great nieces from perishing in the blaze. She phoned their mother, who was with them on the 19th floor to warn them about the fire - giving them enough time to get out of the building. And Munira Mahmud, 34, also manged to escape the burning building, leading the rest of her family - including her husband, his father and their two children to safety. An inquiry into the fire in June last year is still ongoing, and has prompted revelations that a 'miscommunication' between senior fire officers meant attempts to rescue residents on the highest floors stopped for an hour. The inquiry, being held at Holborn Bars in London, has previously been brought to a halt as firefighters burst into tears when recalling the blaze. Meanwhile a series of fraudsters have been jailed for trying to falsely claim they lived in the tower in the wake of the fire. Work to finish covering the tower in white sheeting with green hearts was completed in June this year, and it still stands as a memorial to those who died. However, a commission has been announced to enable the Grenfell community to decide the long-term future of the site. The Hubb Community Project was created last summer by women seeking somewhere to cook fresh food for their families and friends following the blaze which engulfed the 24-storey social housing block. 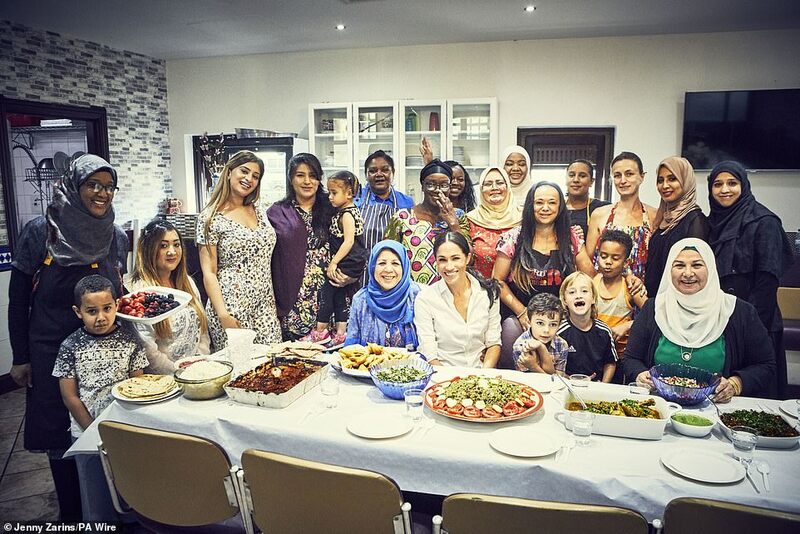 In the new book supported by Meghan, some of the recipes are family favourites and all have been created by the cooks who support not only residents affected by the Grenfell fire but others in the community. 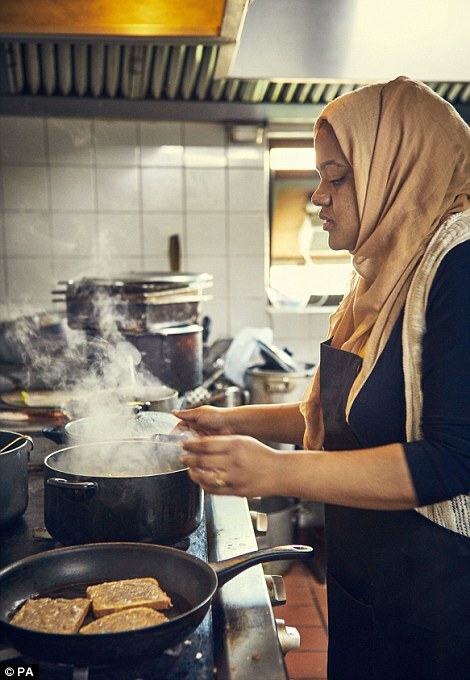 In the introduction, the women of the Hubb Community Kitchen wrote: 'Our kitchen has always been a place of good food, love, support and friendship. 'We cook the recipes we've grown up with; there's no stress, and the recipes always work because they have been made so many times – it's proper comfort food… Swapping family recipes and moments of laughter gave us a sense of normality and home. One of the contributors to the book, Munira Mahmud, 34, said she and her friends had approached Al-Manaar to ask if they could use the kitchen there and the Hubb project arose out of it. 'Last summer, we were placed in a hotel and I had no kitchen to cook for my family,' Ms Mahmud wrote. 'It was very emotional for me to get in the kitchen. The moment I started cooking I was in tears. Why is the community kitchen called 'Hubb'? The Hubb Community Kitchen gets its name from the noun hubb (حُبّ), which means love in Arabic. The women involved with the kitchen said they want to 'celebrate the thing that we all feel every time we meet'. 'Hubb' is a derivative of the verbal root habba (حَبَّ), while the word 'ishq' (عشق) also means love in Arabic. 'I didn't know why though. I was just excited to be back in the kitchen again. The duchess is photographed on the front of the book helping out and Ms Mahmud said the royal had been happy to join in. All proceeds will go back to the Hubb and the book will be available from this Thursday. Baroness Rebuck DBE, chair of Penguin Random House, said: 'We were instantly caught up by the extraordinary vision for this project with the women of the Hubb Community Kitchen. 'Every woman who has contributed a recipe to this book has also contributed a fragment of their lives and memories. Each dish tells a story of culture, family and a sense of home. 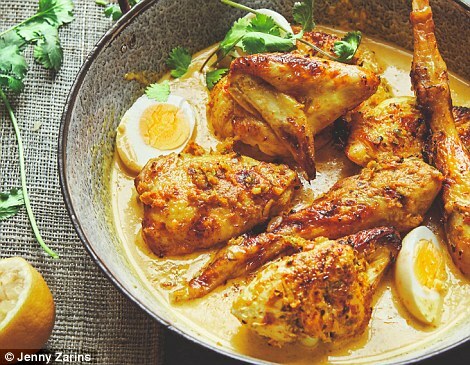 The dishes described in the book are the women's own personal recipes from across Europe, the Middle East, North Africa and the eastern Mediterranean. The Royal Foundation is administering the transfer of funds from the sale of the book to the Hubb Community Kitchen and related projects. Last week it was revealed that more than 1,200 people traumatised by the Grenfell fire received mental health treatment in the year after the blaze, according to figures from Central and North West London NHS Trust. Another 126 patients with long-term mental health problems had their conditions worsened by the blaze in North Kensington on June 14 last year, which claimed the lives of 72 people. The news comes days after the formal opening of the St Charles Health and Wellbeing Centre, where those affected by Grenfell will be treated in new therapy suites. Also today, the public inquiry into the Grenfell Tower fire continued as a control room supervisor said the decision to tell trapped residents to try and escape the burning block 'should have been made sooner'. It took almost two hours before the London Fire Brigade decided to abandon the standard stay-put advice to occupants and ordered a full evacuation. Many of the victims had been advised to remain inside the tower. Last June, the Queen and her grandson Prince William were met with applause when they dropped in to an emergency shelter in West London days after the blaze to meet the devastated survivors. The royal visitors met volunteers, local residents and community representatives while visiting the Westway Sports Centre in White City, which became a focal point for efforts to support those affected by the deadly inferno. 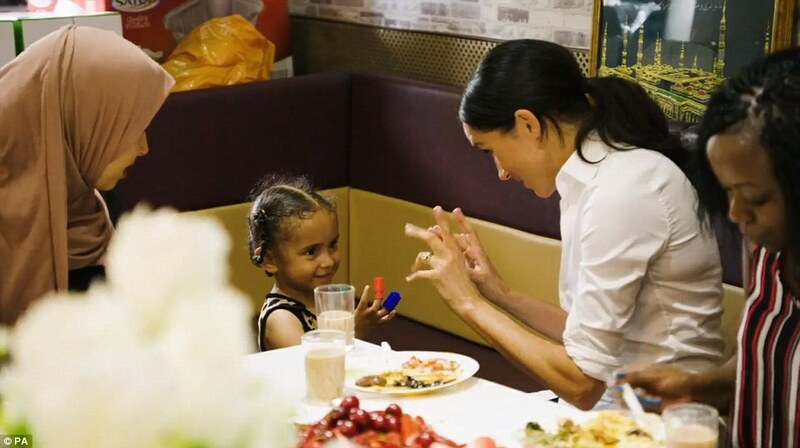 Meghan is part of The Royal Foundation of the Duke and Duchess of Cambridge and the Duke and Duchess of Sussex, and she made her first appearance with the organisation in April. The foundation was launched in 2011 by Prince William and his younger brother Harry – and Meghan officially became its fourth patron after her wedding on May 19. It had an income of £9million last year, and spent £9.7million - including £8.3million on charitable activities, of which £4.3million was made up of grant funding. It was 1976 and our mother was teaching me and my teenage sisters to cook – passing on her recipes. 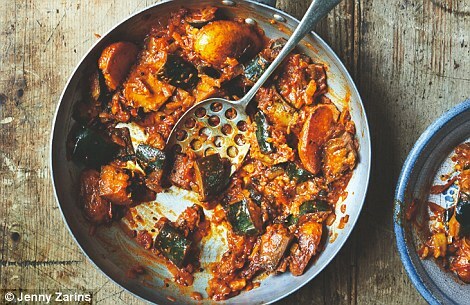 I was the best at making aubergine masala, so she allowed me to call it my signature dish – I've made it ever since. Back home in Uganda, I run a restaurant where I serve this along with other local dishes. When I'm in London helping my daughter Munira with my grandchildren, I make it for them and for the women at the Community Kitchen. Heat 2 tablespoons of the oil in a large frying pan on a high heat. Add the aubergines and fry, stirring often, for 10 minutes or until well browned. Tip the aubergines into a large bowl and set aside. Reduce the heat to medium–high and add 1 tablespoon of the oil to the pan. Add the potatoes and fry, stirring often, for 10 minutes or until golden brown. Add the fried potatoes to the aubergines and set aside. Heat a large pan on a medium–high heat, add the cumin, mustard and fenugreek seeds and toast until fragrant, 2–3 minutes. Then add the remaining oil and, when it is hot, add the onion and curry leaves and fry for 10 minutes until soft and golden. Add the tomato purée and cook for 2 minutes, then add the garlic paste, ginger paste, turmeric and tomatoes. Cook for about 5 minutes, until the tomato juice has evaporated and the mixture is starting to dry out in the pan. Meanwhile, prepare the rice. Put the water and salt in a pan and bring to the boil. Add the rice, reduce the heat slightly, cover and boil for 10 minutes. Remove the pan from the heat, keeping the lid firmly on, and set aside for 10 minutes. Add the fried aubergines and potatoes to the curry pan, along with the water. Bring to the boil, then reduce the heat to a simmer, cover and cook for 15 minutes, stirring occasionally. Remove the lid and simmer for 5–10 minutes or until the vegetables are tender. Add half the chopped coriander and stir through. Remove the lid from the rice and fluff up with a fork. Serve alongside the curry, sprinkled with the remaining coriander. When I was growing up I hated cooking. hen I got married and moved to Africa and suddenly everything changed – I began calling my mother and asking her for recipes. This curry is a particular favourite of my family in Tanzania. Rub one third of the paste all over the chicken, into the cuts and under the skin; reserve the rest of the mixture. In a large pan, melt the coconut oil on a medium heat; add the remaining paste and cook, stirring occasionally, for 20 minutes or until all of the moisture evaporates. Increase the heat slightly and cook for 3–5 minutes until the paste is thick and dark. As soon as I heard about the Kitchen, I volunteered to help, cooking recipes from my homeland, Algeria. This cake is one my Mum used to make. She always said plums are an unreliable fruit – they can be quite sour when raw. This brings out the best in them. Preheat the oven to 170C. Grease a 23cm round springform cake tin with the sunflower oil and place on a baking sheet. For the caramel, put 225g of the granulated sugar into a small, wide, heavy pan on a low heat. Without stirring, let the sugar dissolve completely. Once liquid, let it gently bubble for 15–20 minutes or until it is a deep golden colour. Add 10g of the butter, half the vanilla extract and the salt, gently swirling the pan to combine the butter as it melts. Once fully incorporated, immediately remove from the heat and pour the caramel into the prepared cake tin. Place the plum halves on top, cut side down, nestled tightly together, and set aside. In a large mixing bowl, beat the remaining butter together with the remaining granulated sugar and the brown sugar until pale and creamy: this will take 2–3 minutes using a handheld electric whisk; if you don't have one, use a wooden spoon. Once the eggs are well combined, add the remaining vanilla extract, the cornflour, ground almonds, flour and baking powder to the bowl and fold through with a metal spoon until just combined (taking care not to over-mix), then pour over the plums. Smooth over the top, then bake for 40–45 minutes until cooked through: a thin skewer inserted into the centre of the cake should come out clean. Transfer the cake to a wire rack and leave to cool in the tin for 5 minutes before turning out onto a serving plate. To do this, put the serving plate on top of the tin and flip over before releasing the sides of the tin and removing the base. Let the cake cool for a further 5 minutes before slicing. 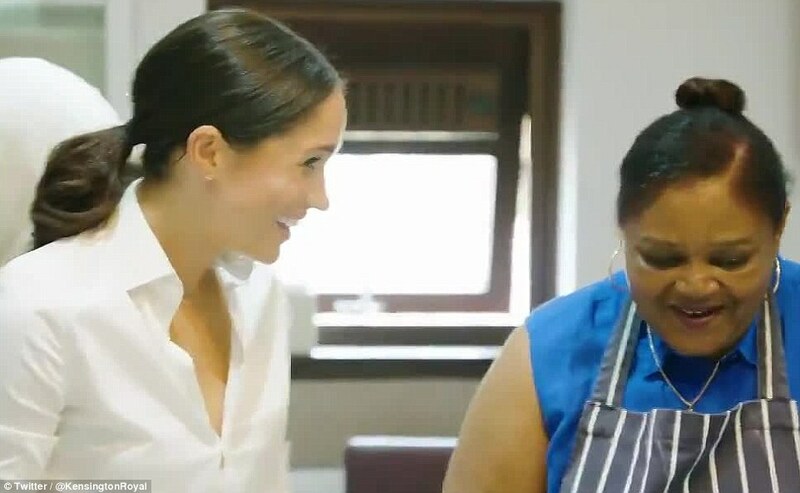 Two of the women who worked on a cookbook with Meghan Markle for the victims of Grenfell escaped from the tower inferno in which 72 perished, MailOnline can reveal. Hiwot Dagnachew was on the fifth floor and saved the lives of her seven and five-year-old great nieces, Yohana and Liva Yohannes, and their mother Ms Mekonnen, 37, by phoning them on the 19th floor to warn them about the fire – giving them enough time to get out of the building. As they made their way out of the West London disaster, they watched ten of their neighbours retreat back upstairs unable to continue. Meanwhile, Munira Mahmud, 34, her husband Mohammed Rasoul, 36, his father Ahmed Abdel-Rasoul, then aged 87, and their two children Mohammed, six, and 20-month-old Zahra Rasoul made their way down the stairs to the bottom of the tower to safety in June last year. 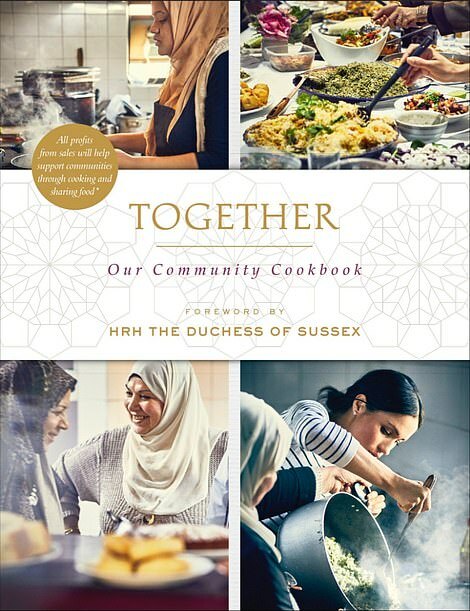 The women are two of the cooks in a new book supported by the Duchess of Sussex in her first solo charity project called Together, Our Community Cookbook, which will be available in stores from Thursday priced at £9.99. 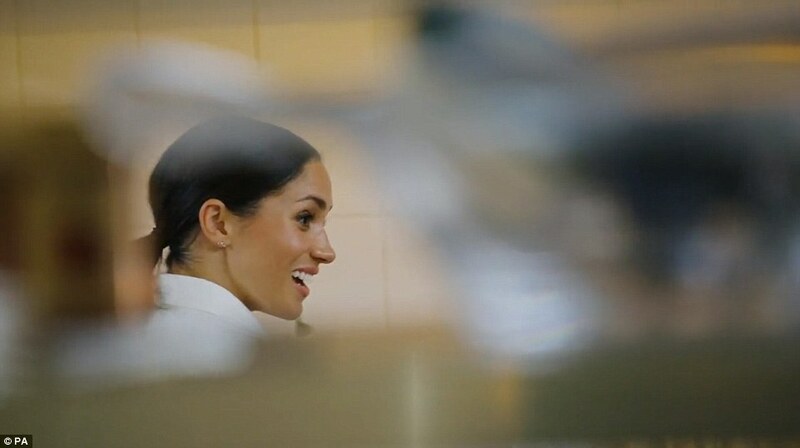 Meghan – who has made secret trips to help the Hubb Community Kitchen volunteers responsible since January this year and has written the foreword – says of the kitchen: 'It's a place for women to laugh, cry and cook together'. Ms Mekonnen – who has her aunt, one of the cooks Hiwot Dagnachew, to thank for her family surviving the tragedy, has told the Telegraph: 'We were fast asleep and my phone rang – I'm so lucky it wasn't on silent. She told how she put on her dressing gown, grabbed her children, trying to keep them 'calm' whilst in 'complete shock' and ran out into the corridor. She told how it was 'hard to breathe', as she held Liva, five, under one arm and held Yohana's hand and descended the stairs, while they were 'coughing and the kids were screaming'. Just as they were about to open an emergency fire exit a firefighter screamed at them to stop because that side of the building above was on fire. He revealed that his wife's best friend and his children's friends passed away, as well as his friend's mother. He told how all their closest friends were there and how he 'prays' that they're going to be 'reunited' with them one day. Ms Mahmud wrote of her involvement with the book: 'Last summer, we were placed in a hotel and I had no kitchen to cook for my family. 'It was very emotional for me to get in the kitchen. The moment I started cooking I was in tears. I didn't know why though. I was just excited to be back in the kitchen again.